Happy Quilting: Dreaming of Paris - A New Pattern!! Introducing Dreaming of Paris, my newest pattern which is now available in my Pattern Shop :) I have been in love with Little Black Dress by Basicgrey from the moment I saw it and new it would be perfect for this super chic quilt design. I love how my eye sees individual blocks at one moment and then lattice strips at the next moment. It just goes back and forth creating some amazing movement. And I am super happy to say that this is my first pattern with size options!!!! Dreaming of Paris has options for a Baby, Twin, Queen, and King size quilt!! This cover quilt is the Twin size and it now belongs to my niece who hugged and thanked me at least 30 times for it. Which just made me oh so very happy!! A little detail :) I love the way the secondary pattern of diamonds is created!! So what do you think??? I hope you love it as much as I do. And, if you do happen to love it, and want to make one for yourself, you are in luck!!! Leah, at Burgundy Buttons, has made up a Dreaming of Paris Quilt Kit featuring the same chic Little Black Dress prints I used!!!! The kit will work for the Twin or Queen size!! (or the baby but you will have a lot of scraps :) The kit also includes the PDF pattern for free and the fabric itself is at a major discount. What a deal!!! 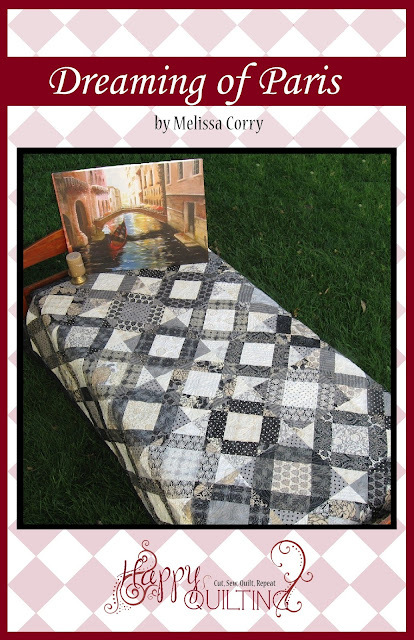 So pop on over and grab a kit for yourself so you can get going on your Dreaming of Paris quilt. Thank you so much for stopping by. I can't say how much I appreciate the support of each of my readers You are what make Happy Quilting grow. When I created this blog two years ago I never dreamed I would be writing patterns or getting published, or basically having people interested in what I create. It is an amazing and humbling feeling. Thank you!!! Great quilt, love the fabric! Congratulations Melissa. What a fabulous pattern. Yippee Skippee! it looks so awesome on ashlyn's bed. thanks again sis!! It is beautiful! And oh the possibilities! Nice looking quilt Melissa! Love how you can see it in various ways. LOVE this quilt! These monotones are fantastic! I'm doing the NY Beauty in monotones but have not finished. Wow, I just love this quilt and how you quilted it. Love Little Black Dress. This pattern really shows it off. Great pattern another one for my must make list :) Love the quilting and fabric too!!! Beautiful Quilt!! I love the cute, little boxed kit. It would be helpful to keep the pieces together! Great quilt! Burgundy Buttons is so VERY awesome! Wish I had more cash, cause it would go there for sure. Wow, that's incredible. I wonder if anyone would like to buy that for my birthday! Woo hoo! Looks fantastic. I have been waiting to see what you did with your LBD fabric! As always, your ability to create patterns simply amazes me. Love it! That is such a great quilt! I love the quilting! This will be on my list of quilts to do! This is a beautiful quilt and I love the simplicity of it, yet it has a lot of character! I'd love to see it in other color ways. I think I'll put that on my "to do" list. Thanks for sharing your amazing talents. It's a wonderful looking quilt! I specially love the quilting on it, it makes it even prettier!